The year’s losses were concentrated in a few, large types of stores. A lot of 2017’s winners were expected. E-commerce did well, home improvement stores set new highs after a long march back from the housing bust, and car dealers (and tire shops) continued modest growth. Retail jobs got smoked in 2017. The sector dropped 66,500 jobs even as the economy as a whole added more than 2 million. 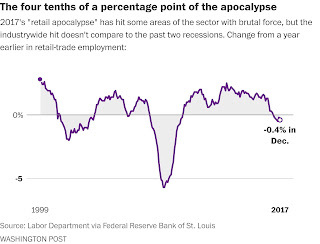 But it’s not fair to dub it a “retail apocalypse” when retail is one of the biggest, most diverse sectors in the economy. Vending machines are retail. So are liquor stores and online auctions. And not all of them got clobbered. Overall the sector fell 0.4 percent. If you don't look carefully at the chart, it almost looks like it broke even. But there's an entire industry worth of turmoil under that purple line. The year’s losses were concentrated in a few, large types of stores. We know this because the Labor Department is kind enough to track it all in excruciating detail. There are 59 distinct classifications in the chart below. The figures only go through November. Each bar is based on the number of jobs, rather than a percentage change. This emphasizes each sector’s direct contribution to retail’s overall slide, and doesn’t allow small movements in volatile, smaller groupings to distort the picture. A lot of 2017’s winners were expected. E-commerce did well, home improvement stores set new highs after a long march back from the housing bust, and car dealers (and tire shops) continued modest growth — though new car dealers couldn’t keep up the high pace set earlier in the recovery. Some of the losers seemed familiar too. 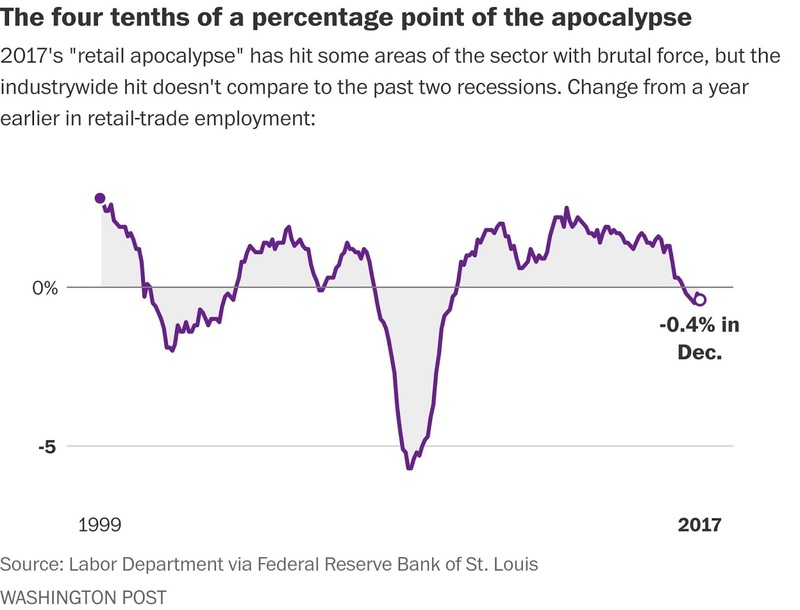 The crisis among department stores has been well chronicled. But others took us by surprise. After having the highest average growth (in thousands of jobs a month) for the entire recovery, Sam’s Club and its ilk saw a drop similar to their losses during and after the Great Recession. Their cousins in grocery were hit as well, though their losses weren't quite as catastrophic.